HAPPY HALLOWEEN AND ONE LAST HALLOWEEN FREEBIE!!! "JACK" IS BACK ONE LAST TIME! BOO!!! ROFL!!! "HAPPY HALLOWEEN" to ALL of you celebrating! I'm trying to recoup from the past week of events and have been in VERY slow mo today, so I thought I would wind up the month of October with ONE last "JACK" freebie from the VERY talented Bonnie Beechler! Thank you for another FABULOUS goodie Bon! This is a scraplet frame, so where you see the writing is actually an opening for you to slip a photo behind of your FAVORITE little munchkin(s)!!! Have FUN tonight and please BE SAFE! WOO HOO!!!! 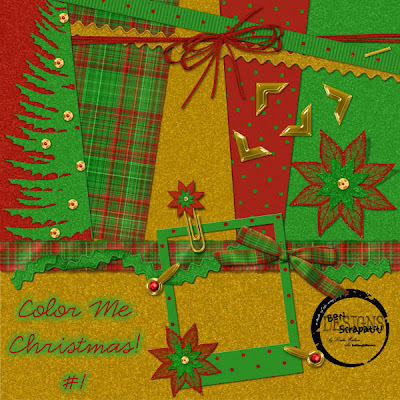 EARLY FREEBIE TONIGHT - COLOR ME CHRISTMAS #2!!! I know that I could have picked another photo, but I just started scrapping today before making a few more items for, "Color Me Christmas, #2"!!! You know how ONE THING just leads to ANOTHER? LOL! I wanted to try out a BRAND NEW ribbon and bow action that I picked up over at Digi Scrap Boutique this afternoon and decided to make us look like a wrapped gift ... kinda, sorta!!! Then I thought how we've NEVER celebrated a Christmas together and that on this WONDROUS occasion, the PRESENCE of CHRISTMAS had, indeed, arrived early! YES ... EARLY Christmas presence AND presents!!! I carry the Christmas spirit within my heart daily as I LOVE to give and this past Saturday was DEFINITELY a day of "receiving" for me! What better gift than to be with family and to know that your mother is healing quickly from a stroke? I am TRULY blessed! I have many projects to complete this week and will be taking some time tomorrow morning to catch up with correspondence!!! Amanda, I owe you my compliance to being TAGGED!!! Tink, I am missing your BLOG prompts that help to get my mind into gear! Please be patient with me as I "catch up"!!! I hope that y'all are having a GREAT week thus far and may you have AMPLE creativity to keep you HAPPILY scrapping! I hope that you will ENJOY the small addition to, "COLOR ME CHRISTMAS" and I'm NOT finished yet!!! Before I forget, with tomorrow not only being Halloween but the last day of October, I will be removing ALL freebies from September through October sometime by the end of this week to make room for ALL of the NEW goodies in November!!! Thank you SO much for your support, WONDERFUL comments and friendship! A FREEBIE FOR YOUR VERY OWN FIREWORKS MOMENT AND MY PRECIOUS MAMA!!! Hi y'all!!! I'm here, I'm here!!! It just took me a bit longer to get this all together than I had anticipated. I will stop here! ROFL .... yeah, right!!! LOL! The rest of my dialog is below and I've even included a photo of Mama with ALL seven of us. If you scroll down to the VERY bottom of my page, you will see a banner-sized color photo of me (far right) with ALL of my brothers and sisters. I do need to stop and clarify as something just crossed my mind! These are not actually ALL of my brothers and sisters!!! I also have two more brothers and a sister on my father's side. There are ELEVEN of us total. Now that is really WILD as I am thinking about it - Robert and I have ELEVEN children between the two of us. ROFL!!! Is not LIFE simply AMAZING? Okay, yes, yes, YES .... I DO have my moments!!! But ALL-IN-ALL ... it's ALL good and I am EVER thankful! 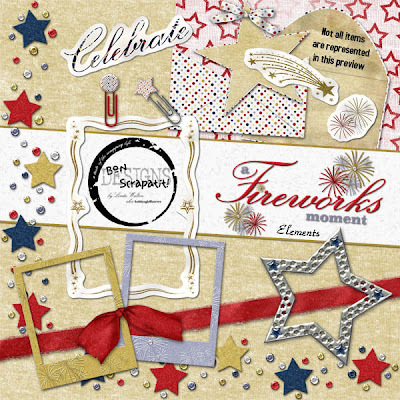 My favorites are the FOIL EMBOSSED fireworks which print out VERY nicely! I used the GOLD for a wedding layout of one of our nieces recently. Mama trying to explain to the audience just how many of us there are!!! Is she not a riot, or what??? Who me? LOL! Okay, I'm figuring this out so give me a break! I am the oldest of the girls, which just naturally makes me the MORE serious and motherly one, right? ROFL! Will you look at my face (far right) - I looked this way in every single photo taken with my camera! I am naturally a "ham" in my own right, but I could not stop looking at ALL of these PRECIOUS faces while listening to their silly antics and keep a dry eye! It is TRULY a FIREWORKS MOMENT for me and one that I shall hold near and dear to my heart forevermore. I remember just putting my arm around my brother Todd and saying, "This is MY brother"!!! 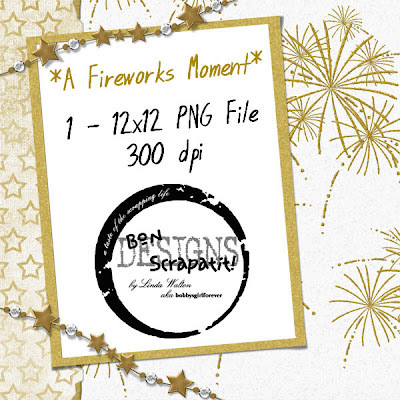 My FREEBIE for you tonight is from my DEBUT scrapkit, appropriately titled, "A FIREWORKS MOMENT"! 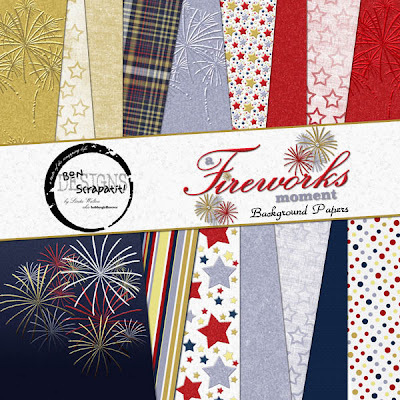 This kit is HUGE (16 beautifully textured BG papers and 60 elements) and is currently on sale in my 3S store for ONLY $3.00! You may find it HERE. I created this kit to be versatile enough for ANYONE around the WORLD to use for ANY special occasion! My definition of a "fireworks moment" is one in which you would LOVE to shout out to the world and/or shoot off some fireworks!!! By the way .... shhhhhhh .... someone at Mama's party did shoot off a couple of pretty spectacular fireworks in the backyard in celebration of Mama's "80" years and first-time gathering of ALL seven of her children! It was SO awesome!!! A VERY special, from the depths of my soul, THANK YOU to all of you for taking the time to post your well-wishes, Happy Birthday wishes and thoughts about this MOST remarkable and blessed time in our lives! I'm going to run out of kleenex here pretty quick now - I am SO deeply touched. Y'all RAWK ... and then SOME!!! 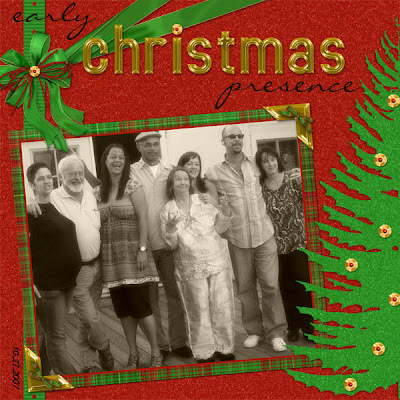 I will work on adding to "Color Me Christmas" tomorrow and have something posted for you tomorrow night! I was also going to mention that I rotated the SCRAPATIT to better house my photo and it turned out okay! I usually don't like to rotate where there is shadowing or beveling involved as it throws the light source off but this did not seem to be as affected as I would have thought!!! Bon Scrapatit y'all ... until tomorrow! HAPPY FRIDAY EVERYBODY!!!! Tomorrow is the BIG day for Mama and for me!!! Mama celebrates the BIG "8-0" with a BIG BASH and FAMILY REUNION! Me? I will be meeting a younger brother for the VERY first time!!! I'm just a wee bit excited you know! ROFL! I've had the little guys with me ALL day and I am exhausted (he, he .... as she NOW has to admit that she is INDEED getting older!) so I hope you won't mind that I've pulled a little something out of the archives for tonight's FANTABULOUS FRIDAY FREEBIE!!! I'm just adding to the FLORAL FRENZY I started last night and thought it might be a NICE and WELCOMED shift from ALL of the Fall, Halloween and Thanksgiving goodies coming your way! THANK YOU for ALL of the SWEET and WONDERFUL comments! 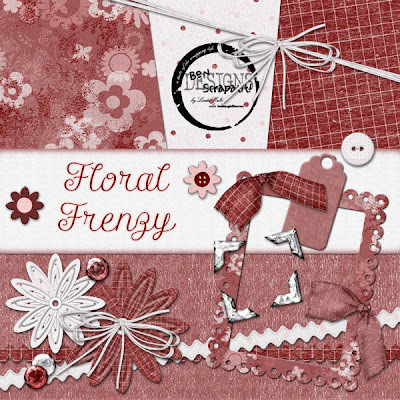 I am guessing that you like FLORAL FRENZY!!! That is WAY kewl! Y'all are INSPIRING me!!! I will try to come up with something special Sunday night (we should be home late Saturday night, so I MOST likely will not have anything to post unless I have a chance to get it uploaded before leaving in the morning which is unlikely but, you never know!). How was your week? Anything EXTRAORDINARY that you'd like to share? Anyone being affected by the fires in Southern California? I've not heard any news today so I'm not sure where we are standing at the moment other than they are now suspecting arson and that just grieves my soul. ENJOY your weekend and may you have enough creativity to keep you HAPPILY scrapping! 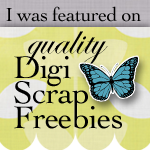 DIGI-SCRAP ADDICT'S CROP FREEBIE AND ASSIGNMENT!!! POST A LAYOUT AND RECEIVE A FREE ADD-ON! Good morning everyone! I think I've figured out that BLOGGER and I are on the same schedule so I may have to alter mine a bit!!! I always try to post before midnight so that I've blogged everyday, but LAST night, Blogger would not let me upload my image so here I am into tomorrow!!! ROFL! Last night was my bi-weekly Digi-Scrap Addict's meeting!!! Thanks to ALL who were in attendance - we had a GRAND time and it has been decided unanimously that beginning January of 2008, I will be helping, teaching, sharing or whatever else you may wish to call it, how to do things you've been struggling with in Photoshop and/or Photoshop Elements! WOO HOO! I LOVE helping people learn NEW things and I am sure that I will be learning right along with y'all! I am by NO means an expert, but I can teach you some EASY, FUN and EFFECTIVE skills for you to put to use in your layout creations and/or some basic designing. We will learn how to create some basic background papers including making your own overlays for dotted papers, striped papers and repeating patterns. Oh, I am getting excited just thinking about it! Photoshop Elements does not play actions, but we can learn how to apply styles for some REALLY cool elements such as brads, eyelets, bookplates, staples, frames, etc. You will be surprised just HOW easy it all really is! Well, the basics anyhoo!!! I will be posting a PREVIEW of the FREE add-on both in the DIGI-SCRAP ADDICT'S FORUM (first link above) and here on my blog by tomorrow night. The DEADLINE for posting your completed layout, as assigned in the forum, is MIDNIGHT EST, Wednesday, November 7th. (The date my next SAD kit is due in the store!) I will begin PM-ing the FREE add-on sometime next week and then every few days after that as I see new layouts being uploaded to the gallery. This is open to ONE and ALL. 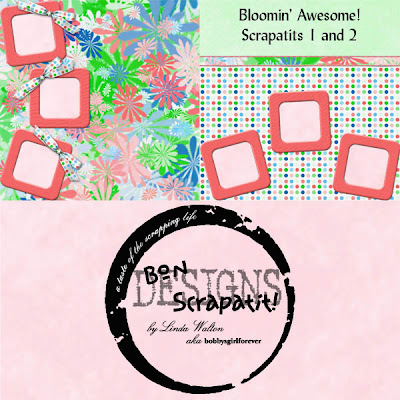 If you wish to post a layout but are not yet a member at 3Scrapateers, it only takes a few moments to register! 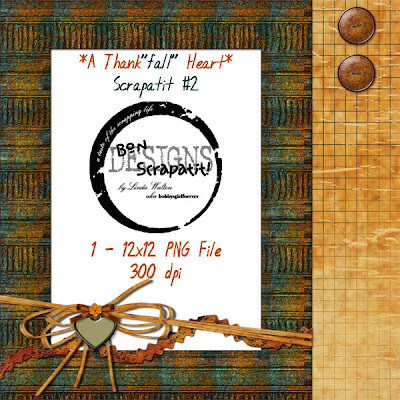 This is a FUN way to meet new digi-scrappers, feed your addiction, complete layouts and, of course, receive FREE kits!!! I will answer to the best of my ability just as quickly as I am able. Please feel free to post any ideas of what you might wish to learn come January. I will make a list and pull the MOST POPULAR requests to use for the first month, which will consist of two bi-weekly meetings. An ATTENDANCE GIFT will be given out at EACH meeting! I will post updates in the forum as it all comes together! Thank you SO much for your input - it is GREATLY appreciated! Tomorrow is ..... well .... you know .... time for a FANTABULOUS FRIDAY FREEBIE!!! WOO HOO! FREEBIE ALERT!!! SCRAPATIT #11 AND A BIG "THANK YOU" FROM MAMA AND ME! Greeting everybody! Is it just me, or is anybody else dragging along this week? LOL! Well, I pretty much know why "I" am and after this weekend, I'm going to try to take it easy and recoup my mind!!! Yes, mostly mental fatigue, but nothing a little "let down" time can't take care of! Mama is VERY touched with the outpouring of well-wishes from y'all and she says to tell you ALL, "thank you so very much". I would also like to, once again, give thanks to you as well. Y'all have helped me MORE than you will know to keep my wits about me and focus on what I've needed to do! I won't say that I've accomplished all that I set out to this week, but I did plug along and was able to keep fairly focused - THANK YOU!!! Y'all are just TOO sweet! When Mama answered the phone at around 8:15 pm, she sounded tired to me. We did not talk too long as she began to yawn and I had to tease her about them giving her quite the workout and she was WHOOPED!!! Mama is quite the NIGHT OWL, so to hear her SO tired SO early was priceless! They are keeping her BUSY! LOL! She certainly cannot complain about being bored there!!! She's also still working on making favors for her party - bless her heart! She wouldn't tell me what they were, but then I told her I did not wish to know. Believe it or not, THIS GIRL loves surprises!!! NOPE, you'd NEVER catch me shaking gift boxes under the Christmas Tree!!! Now, that's not to say that I might not look at a box and try to guess what is in it!!! Guess what??? Mama will be released Friday morning at 11:00 am PST! How's that for timing? Party starts at 1:00 pm PST on Saturday. I hope you have ENJOYED the SCRAPTITS! I am going to make ONE more and at the beginning of November, I will add them as an 8x8 album to my store. By the way, tonight's SCRAPATIT was made to compliment SCRAPTIT #9! If any of you scrap an album with my pages or even if it is just a few pages, I would LOVE to see them. You can e-mail me at: bobbysgirlforever2001@gmail.com with a link to your favorite gallery or just send a preview sized jpeg. Pretty please! I would LOVE to post some of them here on my blog. Next week, I am going to work on adding a slideshow for layouts created by the TALENTED ladies on my CT and I would also LOVE to add one for all of YOU talented ladies and gentlemen! Have a TOTALLY awesome Thursday y'all and if you have the opportunity, I hope to see you in the 3S chatroom at 10:00 pm EST for my bi-weekly Digi-Scrap Addict's Meeting!!! I ALWAYS have a gift just for attending! SCRAPATIT #10 FREEBIE AND HAPPY "80TH" BIRHTDAY MAMA!!! WOW!!! Mama had a FABULOUS day today! She made me tired just listening to all she accomplished! Mama played soccer, basketball, threw some darts, did a bit of gardening, walked up and down stairs and even made a trip to Walgreen's!!! ROFL ... I told Mom that I think "I" need to check into this place!!! I sent Mama a nice BRIGHT and COLORFUL bouquet of flowers along with a few balloons as I figured she'd most likely not have any visitors today. We are ALL so far away and everyone is driving up for the BIG party on Saturday. The staff did do a wee bit of decorating and Mama was in good spirits, although a bit distressed as she was concerned about my siblings living in Southern California and wondering if they were all okay. I called my baby sister and she assured me that none of them were close, but then found out that my sister, Candy, is about 10 miles from one of the fires and she was at Kathie's house when I called. The air is horribly smoky and breathing can be difficult according to Kathie who is seven months pregnant. I do pray that they are able to contain these wildfires ASAP. Kathie made a call to Mom to let her know ALL is well and to wish her a Happy Birthday! Hope everyone has had a BEAUTIFUL beginning to a WONDERFUL week ahead! WOW!!! I missed yesterday! LOL! Actually, I missed computer time as we had my fiance's two youngest boys for the weekend. Wyatt is 8 and Garret 6 - need I say more!!! They are SWEETHEART'S, but busier than all get-out and needing our attention every moment! My youngest are twin boys and they just recently became adults! Sort of like having grandchildren, but not! Did that make sense??? ROFL! I just realized that my "ABOUT ME" is all about my business life and nothing about my personal life, so I shall have to work on adding a little bit about my family! There are A LOT of us! LOL! I spoke with Mama late afternoon/early evening and her progress is simply AMAZING! She is walking very well and there is still heaviness in her right arm which will most likely remain for a few months according to her doctors. They did give her a coordination test and she passed with flying colors and the nurse was in awe! Mama's nurse told her that her left and right arms are equal in strength. Normally, if we are right-handed, our right arm would be stronger - SO, not bad! Mama officially turns "80" tomorrow the 23rd and my little brother (different mother) turns "50"!!! HAPPY BIRTHDAY Mama and Tom!!! So how is Mama spending her time in the rehabilitation facility? She is working on favors for her BIG BASH on Saturday!!! Now doesn't it sound like she is ready to go home? She's hoping for a Thursday release. Well, after posting Bonnie's GORGEOUS scraplets (scrapatits), I obviously have been inspired!!! I hope you like it. I have one more to complete for a set of 10, but may add an extra as I had not realized that Bonnie's two were pretty much the same as she had included one PNG file and one JPG. Yours truly changed it to a PNG file as I did not think it would be so easy for someone to add three photos on top of the layer without a lot of cropping. Until tomorrow - Bon Scrapatit! SUPER SATURDAY SURPRISE!!! TWO FREEBIES FROM BONNIE BEECHLER AND AN UPDATE ON MAMA! Thank you ALL so much for your continued thoughts and prayers for Mama, she is TRULY amazing and her STRONG WILL and QUICK RECOVERY have doctors and nurses in AWE! We finally received the results of Mama's MRI and it showed some slight narrowing of the arteries on the left side of her brain, which explains the difficulty with her right arm and leg. All of her other tests were normal! Her carotid arteries are CLEAR!!! Mama was moved from the hospital to a rehabilitation facility yesterday afternoon! They had her walking up and down stairs!!! WOO HOO! GREAT news! They don't really do anything over the weekends so, come Monday, she will start her therapy. When she answered the phone this afternoon, I asked if they were wearing her out? She replied, "NO, I'm wearing them out!" That should give y'all a GOOD idea of how well she is doing! With her BIG BIRTHDAY BASH celebrating "80" years taking place a week from today, the doctor has told her that if she is not ready to leave the facility by the 27th, he will give her a DAY PASS!!! What a guy! ROFL! Good thing, as I have a sneaking suspicion that Mama would find her way out anyhoo!!! LOL! TONIGHT'S "Super Saturday Surprise" is a set of scraplets created by Bonnie Beechler using *A Thank"fall" Heart which will constitute Scrapatit #7 and #8! ENJOY!!! Hope y'all are having a TERRIFIC weekend thus far and I am SO glad that the Halloween Brag Book has come in handy for some of you!!! Thank you SO much for your SWEET comments - y'all are such a JOY to hear from! It's FRIDAY y'all and it's FREEBIE time! Okay, so EVERYDAY has been FREEBIE time as of late, but this one is EXTRA special!!! For those who attended and posted their project for Pam's Creative Crafty Crop earlier this week, this was given as a crop freebie and posting bonus and you won't need to download again! I hope y'all ENJOY this SWEET little BRAG BOOK that will SHOWCASE some of your MOST memorable Halloween moments! This is actually the FIRST brag book that I've made and I had GREAT fun putting the pages together - I hope that you like them! If you know of anyone that might be looking for a little something to put together a QUICK album, please let them know as I will only leave the links for downloading until MIDNIGHT, Sunday, October 21st, after which I shall be uploading to my 3Scrapateers' store!!! I just could NOT resist giving y'all a TREAT!!! I have another personal quote to leave you with tonight. This one I made into a piece of word art that is included in my FREE mini-kit in this month's DEBUT issue of 3Scrapateers' Scrap Style e-zine and I will post more info on that in the morning! "New beginnings are only a SUNRISE away!" - this came to me as I was thinking about our theme for the debut issue of Scrap Style, which is NEW BEGINNINGS and what I would do for a FREE mini-kit. You know how you just start thinking about something and one thought leads to another and so on!!! Well, I was thinking about the fact that when I arise each morning, I am thankful that it is a NEW day and that I can put behind me any negative portion of the day before. Thus cometh the thought about the sunrise bringing about the opportunity to start ANEW! Have a SPECTACULAR Saturday y'all! A DOUBLE FREEBIE ALERT TONIGHT!!! SCRAPATIT #6 AND ANOTHER GOODIE FOR Y'ALL!!! I'd like to extend a BIG "thank you" to those of you who joined me at tonight's Half-n-Half crop/chat!!! I had SO much FUN and it was SO exciting to meet some NEW members and share some laughter together! Laughter TRULY is THE BEST medicine and I know that it is what keeps me going MANY times over! It's been a rather LONG day, although I have not accomplished much! It took me until this afternoon to get settled down here at the computer! 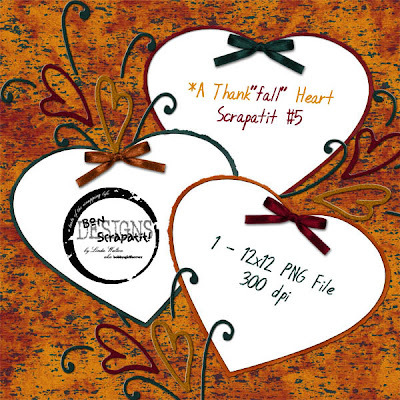 Tonight, you will find *A Thank"fall" Heart* Scrapatit #6 plus a little something extra that I gave out at the crop earlier. I hope that some of you are finding some time to start an album with my SCRAPATITS, although if you are like me, you will wait to receive them all so that you can put them in the order that you prefer. My overstimulated brain is about ready to shutdown for the night, so I shall leave you with my OWN personal quote that I should have posted here somewhere on my blog! I learned LONG ago that I was not only meant to be challenged, but that I actually thrive on being challenged and, interestingly enough, seem to produce my greatest works (whatever they may be) when my mind is put to the test! Have a GORGEOUS day tomorrow y'all and Bon Scrapatit! 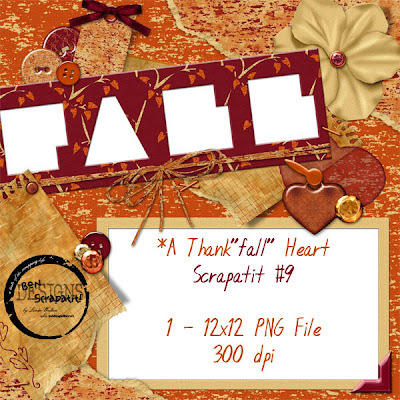 REMINDER: Half-n-Half Crop tonight in the 3Scrapateers' chatroom featuring *A Thank"fall" Heart! Just a quick reminder that TONIGHT is the night that I am hosting the Half-n-Half crop at 3Scrapateers'. The crop will be featuring my *A Thank"fall" Heart* scrapkit, which you can still purchase HERE for ONLY $3.00 until MIDNIGHT EST tonight! I am including the two images once again of both parts of this HUGE kit and will explain how you can receive the second part for FREE at tonight's crop. There will also be a coordinating FREEBIE! FREEBIE ALERT!!! 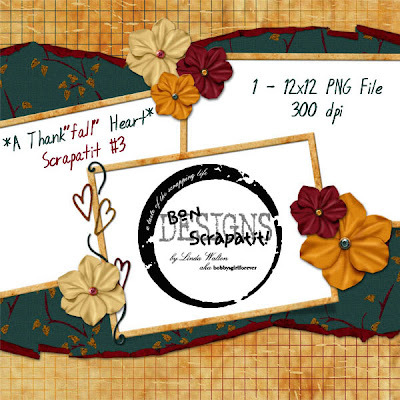 *A THANK"FALL" HEART* SCRAPATIT #5 HAS ARRIVED!!! LOL! Good news for y'all this morning (DID NOT make it in by the click of my mouse this time! ), NO rambling from me! I take my commitments seriously and could NOT leave y'all wondering what happened to Scrapatit #5! Just finished zipping it up and uploading! I've spent the majority of my day on the phone with family concerning Mama and I spoke with HER as well. She is doing MUCH better today! They have had her up walking with a walker and a cane down the halls, to the restroom and such and even had her sitting in a chair. Her spirits are HIGH and she had me crackin' up!!! I'll catch y'all up later TODAY (EEEEEKS .... I've turned into a pumpkin!) after some GOOD sleep! Thank you again for ALL of your thoughts and prayers - I am deeply touched. FREEBIE ALERT!!! 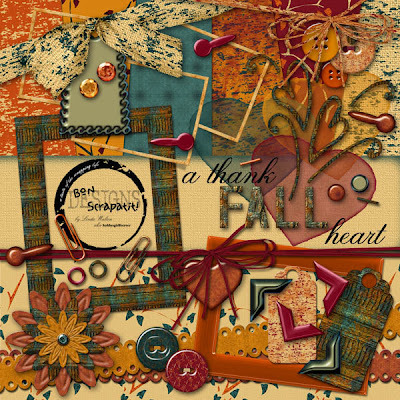 *A Thank"fall" Heart Scrapatit #4! I'm in by the click of my mouse as it quickly approaches the MIDNIGHT HOUR!!! Scrapatit #4 is pretty simple and I played with it for a while! You know how you just have those times when the MOJO has got up and went? Well, this was one of those times! I think this one will be great for a variety of photos and you have lots of room to add your own goodies if you choose to do so. I would really LOVE to see what y'all put together and would encourage you to either post them to a gallery somewhere and e-mail me the link OR you can simply e-mail me the jpg and I would LOVE to post them right here on my blog!!! SURPRISE ME! ROFL!!! I did not get much accomplished on the computer today as I was able to catch up with my two best friends and digi-sisters on the phone today AND spent quite a bit of time speaking with Mama! I had tried calling Mama at 11:30 am PST and they had indeed tested her to the point of exhaustion. She said she needed to nap and I told her to call me when she felt up to talking and that I would call her right back. She called me at about 4-ish this afternoon (yesterday now!) and had just returned from having an MRI. We should know the results of her tests sometime tomorrow I imagine. They have her up using a walker as she is still having difficulty with her right arm and leg. She will be needing therapy upon release from the hospital and her living arrangements will change a bit as well. Well, this girl is TIRED tonight and the 'ol eyeballs are barely at half-mast!!! 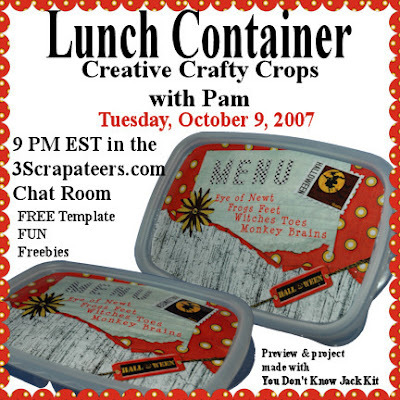 I will try to double-up on Scrapatits tomorrow as I will be hosting my Half-n-Half crop at 3Scrapateers on Thursday night and will most likely not have a chance to blog! Now that is a horrible thought! I'm just getting used to this! Thank you ONE and ALL for your kindness, your well-wishes and prayers for Mama - I just LOVE my digi-sisters! What a MOST incredible community of women (and men!) that come together with such HEART! May you all have a WONDERFUL Wednesday and Bon Scrapatit! I was just preparing to zip up tonight's FREEBIE when one of my sons brought the phone to me with my Uncle Greg on the other end of it. First thought that went through my mind was that my mom (she lives with us but has been away visiting other family) was at his house and he was going to be bringing her home at the end of the week. Instead, Uncle Greg informed me that Mama was in the hospital and had suffered a mild stroke. He let me know RIGHT away that it did not affect her speech and that it looks as though she will recover 100% from the doctor's findings thus far. WOO HOO! PHEW! No one EVER likes getting these types of phone calls, however when your parents are getting up in age, you try to prepare yourself for it as best you can. I just met my mom 10 years ago this month. I was flown to Hawai'i for her 70th birthday and then we all gathered here in California the following month for a BIG Thanksgiving reunion. 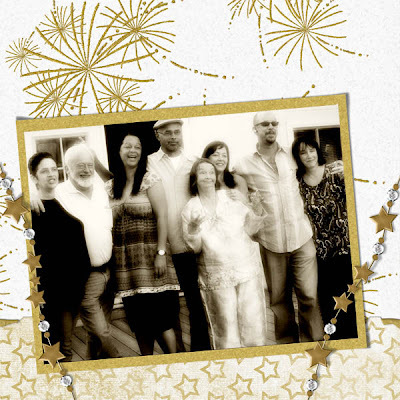 I met two brothers and three sisters for the first time along with cousins, aunts and uncles. It was a DEFINITE "wow" moment in my life and still is! On the 27th of this month, we are gathering reunion-style once again to CELEBRATE my PRECIOUS Mama's 80th birthday!!! I will be meeting one brother who was not able to make it to the first reunion. My brother, Todd! I am SO excited!!! We have spoken on the phone but this will be our FIRST face-to-face encounter! I spoke with Mama on the phone right after hanging up with my Uncle. She sounds WONDERFUL - completely coherent! We were talking away as we always do! That should come as NO surprise to y'all!!! ROFL! I shall be giving her a call in the morning to see what the hospital plans on doing. They will be running some more tests and she is having some difficulty with her right arm and leg "cooperating" as she put it to me! We have A LOT of HUMOR in our family so I needn't tell you how much giggling we were doing as she admitted that God has FINALLY gotten her attention and made her understand that she simply CANNOT do everything she was able to when she was younger! My mom is a VERY independent person and it is not unusual for me to find her rearranging her bedroom furniture late at night! Heavy stuff mind you! YES, she is a NIGHT OWL! Isn't it amazing how much of us is genetic!!! Only THIS girl has learned to slow down a bit and put herself to bed before she turns into a pumpkin!!! SWEET DREAMS all and I hope you enjoy Scrapatit #3! ANOTHER FREEBIE ALERT!!! And ... a BIG apology from the resident BOOF! And just what is it I need to apologize for you ask? 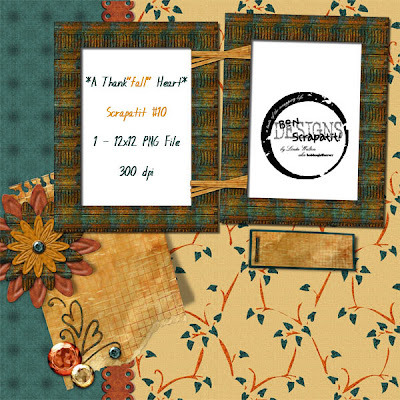 Oh, my heart just sank when I was preparing for y'all another SCRAPATIT from my *A Thank"fall" Heart* scrapkit only to find that I had made a BIG boo-boo on the first one that I uploaded for y'all last night!!! HORRORS! I am a rather detail-oriented person, however, that does NOT always mean that I catch things when I should!!! Okay, so what is the BIG BOOF I made? Well, I had applied a "red" stroke to the film strip to make sure that I did NOT have ANY stray pixels lurking about and .... well .... YES, I forgot to remove the "red" stroke before saving it as a PNG file! You can even see the stroke on the preview!!! I think the reason NOBODY has made mention of it is that it looks like it was meant to be part of the element!!! NOT! If so, it would have been "cranberry" and not BRIGHT red!!! Now, how do I ask the OVER 600 people who have visited my blog today to download Scrapatit #1 to please disregard it and to download the CORRECTED file??? I am SOOOOOO sorry and YES, I am human and it tis human to err! The lesson learned from this little mishap - CHECK, CHECK and THRICE CHECK to make sure that EVERYTHING appears in order before the FINAL SAVE!!! 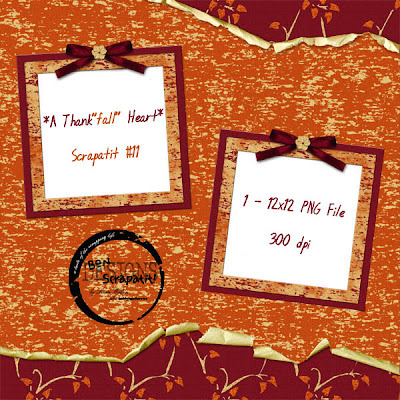 So, without further ado, you will find below the NEW download link for Scrapatit #1, a layout I have created with Scrapatit #2 and, of course, it's DOWNLOAD LINK! I will be removing the OLD link and replacing it with a note to look here for the NEW one! I am DEDICATING Scrapatit #2 to Sue, who posted that she would LOVE to put together a FALL album but is NEW to digital scrapbooking and does not know how to make such NICE pages yet! Thank you for the LOVELY compliment Sue! 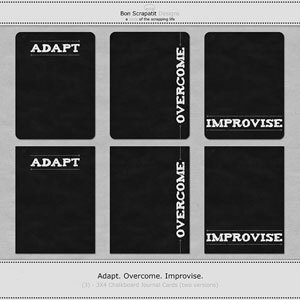 I am going to try to add a new SCRAPATIT each day (or my night!) this coming week to give you enough pages for a 10-page album. Forgive me if I may double up on a day or two as I have several projects in the works, but rest assured that they will make an appearance! Again, THANK YOU ALL for your CONTINUED SUPPORT and I must say that you are helping ME to get some SCRAPPING done for myself as well!!! WOO HOO! Have a FANTABULOUS week ahead everyone and Bon Scrapatit! stayed for a month! Ahhhh .... Italia .... la vita dolce! FREEBIE ALERT!!! NEW kit, NEW LAYOUT and COORDINATING FREEBIE!!! WOO HOO!!! Hi y'all!!! Hope that you've had a PRODUCTIVE Saturday whether it be catching up on things at home after a LONG week at work, creating layouts, designing kits or RELAXING and REJUVENATING your mind, spirit and body! Me? Well, I guess I am sort of on a roll and am not quite ready for the BALL to STOP quite yet! I still have SO much to learn and SO much to do, but I am THOROUGHLY enjoying EVERY moment of it all! Thank you SO much for those of you that take a moment to leave a message of "encouragement" or "thanks" - it REALLY means a lot and I DO read each comment left and will try to reply if I can find my way to your blog! 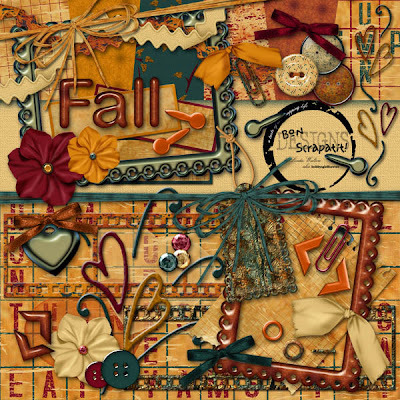 Well, this week is my VERY first Half-n-Half at 3Scrapateers and the name of my new scrapkit is, *A Thank"fall" Heart*, which boasts a RICH and WARM color palette suitable for your Autumn/Fall, Thanksgiving or ANY family-oriented, outdoorsy/nature scrapping you need to do! As there are SCRAPPERS all over the WORLD, I try my hardest to make my scrapkits versatile enough for ANYONE to be able to use them. In other words, I know that MANY of the holidays we celebrate here in the US are not celebrated elsewhere so I try to make sure and incorporate designs that are not "exclusive" to any particular holiday. A GOOD example would be, A Thank"fall" Heart! 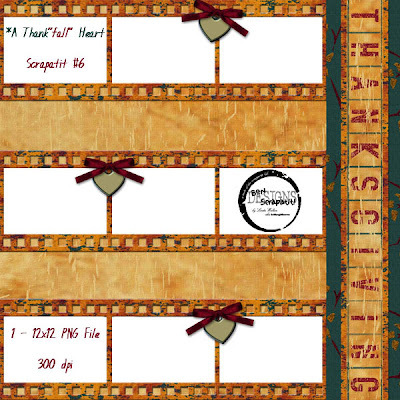 I have added two Background Papers suitable for Thanksgiving, however, they and everything else can be used simply for the AUTUMN/FALL season or an EVERYDAY family get-together and/or event! The layout I have completed was, believe it or not, TOTALLY happenstance as I had NO idea the color palette I chose would work SO perfectly with these few photos of my first two children back on Thanksgiving in 1981!!! Funny how that works sometimes, isn't it? ROFL! The subconscious is an AMAZING thing, eh??? The FREEBIE scraplet that I am leaving you with tonight is from my layout! I am thinking of putting together an album from this kit to put into the store - WHATCHA think? I'm trying hard to follow my OWN heart and instincts in my designs and while there is GREAT popularity for clusters and such, I seem to prefer to design my kits so that YOU, the SCRAPPER, can put things together the way that you wish to - TRULY making it YOUR own! I've pondered upon this for a few weeks now and have thought what I will do is keep my scrapkits customizable and then offer up scraplets, clusters, frames, etc. as COORDINATING FREEBIES here on my blog! I'd LOVE to hear from you, so leave me a message as to what you tend to look for when hunting for designs to scrap with!!! 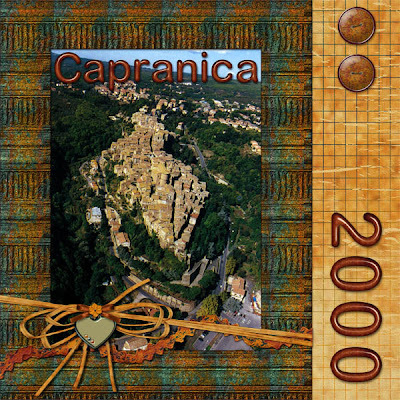 ENJOY the scraplet and if you like it, please send your friends on over to download it too! Thanks SO much for looking and Bon Scrapatit! Messaging system! Sign up is a piece of cake! help, especially after delivering the last two, who are TWINS! FANTABULOUS FRIDAY FREEBIE has ARRIVED early even!!! LOL!!! SURPRISE, SURPRISE, SURPRISE!!! And you thought it would be MIDNIGHT before you'd find my FFF for this week!!! How's that for a TRICK and a TREAT! 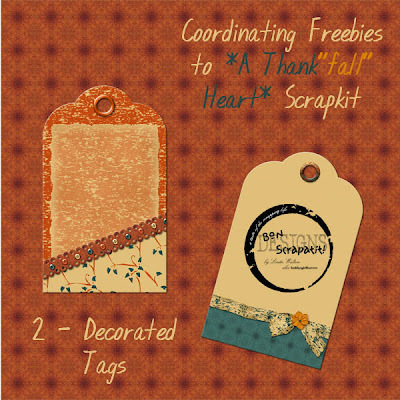 This week's AWESOME freebie is courtesy of my BELOVED 3Scrapateers' sister and friend, Bonnie Beechler. I just FELL in LOVE with this ADORABLE business card album when Bonnie first shared it with me and she has been SO kind to allow me to offer it to y'all! It is, of course, made using my, "You Dont' Know Jack" scrapkit! THANK YOU BON! Some of you received this as an attendance gift last night at my Digi-Scrap Addict's meeting, so for those of you who already have it, STAY-TUNED as I shall be posting another FREEBIE for y'all either tonight or tomorrow! Hope everyone has had a FABULOUS and PRODUCTIVE week and are looking forward to a NICE and RELAXING weekend!!! Me? Uhm ..... well .... hmmm .... you KNOW where I'll be!!! LOL! Have a SPECTACULAR weekend y'all and may you have PLENTY of creativity flowing to keep you HAPPILY scrapping! WOO HOO!!! 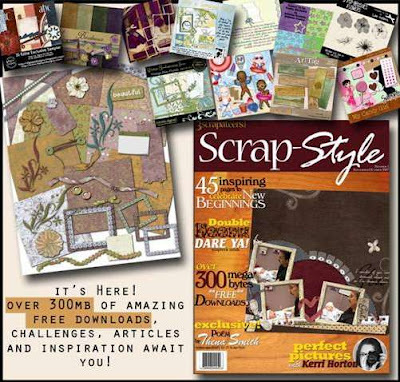 3S Scrap Style E-zine has just HIT the STANDS!!! Well, actually it's just HIT the 3S store and you can find it HERE! ONLY $3.50 and OVER 300 MB of downloads for your SCRAPPING pleasure!!! Don't miss the DEBUT issue as I'm sure you will find it an INCREDIBLE read from COVER-to-COVER!!! I'm LATE, I'm LATE .... for a VERY important date!!! Well, as Tara mentioned tonight in the chatroom, "when it rains, it pours" or it's a DRY spell!!! Even the BIGGEST digital umbrella could not stop the FLOOD in my list of "things to do"!!! ROFL ... but then, I 'd much rather have TOO much to do than not enough, wouldn't you? I said that I would post PREVIEWS of the "You Don't Know Jack" brag book for those who have already attended Pam's, "Creative Crafty Crop" earlier this evening OR for those who still wish to participate. I haven't checked Pam's thread in the forum yet, so I am not sure what the deadline is but will update as soon as I am privy to the info!!! Pam gave out two of the pages as Attendance Gifts for attending the crop and will give the rest of the BRAG BOOK as a POSTING BONUS to those who complete their project and post to the Creative Crafty Crop gallery. Again, I will check the details and post here for you. I am just wrapping up my FIRST Half-n-Half kit, "A Thankfall Heart" and should have it in the store LATE tonight or EARLY morning!!! Not sure why, but I've just sort of struggled a bit with this one. I think it had to do with trying out some new AWESOME "rustic" styles and playing around with them and then deciding to leave them in their NATURAL state!!! I will post a PREVIEW of "A Thankfall Heart" tomorrow morning. I could not find a color palette that would JUMP right out at me, so I created my own and hope y'all like it! Okay, enough jabbering-jibberish!!! I get SUPER wound-up when I'm tired and can talk and/or type 100 miles per hour!!! I am drowning in Photoshop as of late and have come up for some air and to visit with y'all!!! When I've had a LONG day, it is SO wonderful to "pop" in and see what everyone has been up to! I'd like to thank EVERYONE for your WONDERFUL comments and sharing a bit of yourself with me! Y'all RAWK!!! 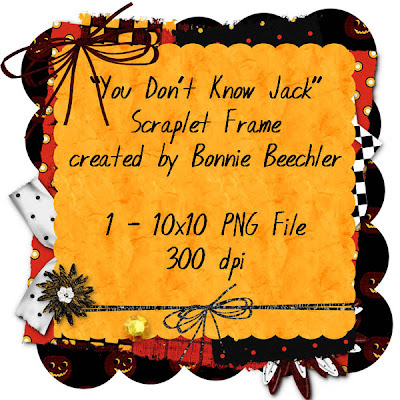 Pam, our resident CRAFTING QUEEN at 3Scrapateers is having her MONTHLY "Creative Crafty Crop" in the 3S chatroom at 9:00 pm EST, TONIGHT, and will be featuring my "You Don't Know Jack" scrapkit in her VERY specially prepared craft for the month of October!!! 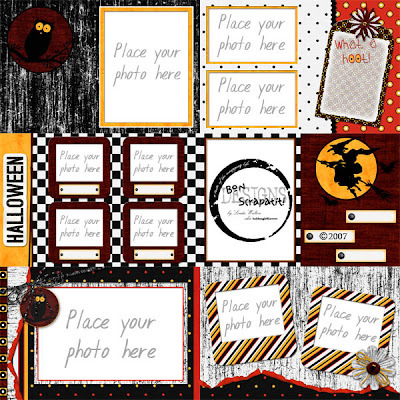 I have created this DARLING Halloween brag book for y'all to receive FREE by attending Pam's crop and posting your project to the gallery by the deadline that Pam will give you in the CHATROOM!!! Pam has an ENDLESS supply of crafting ideas and I am SO jazzed about her upcoming "12 Days of Christmas and Hanukkah" class, which begins October 15 and is ONLY $15 for a TOTAL of 12 CRAFTS, which will help to whittle down those Christmas shopping lists VERY quickly!!! WOW!!! That's just a few pennies over ONE DOLLAR per craft template that Pam will have for us!!! The class runs for a period of four weeks! You may find all the information HERE. I wish to invite y'all to join Pam (I hope to drop in for a while as I am working on my FIRST Half-n-Half scrapkit which will be uploaded into the store tomorrow evening - WOO HOO!!!) TONIGHT for a FUN time and a REALLY "kewl" craft project. I am posting an image so that you can see EXACTLY what the project is and I WILL also post PREVIEWS of the BRAG BOOK, that you can earn for FREE by attending the crop and participating in the craft project, later on TODAY!!! It's time for a FABULOUS FRIDAY FREEIBE from Bon Scrapatit Designs!!! Hi y'all!!! How's EVERYBODY doing this FABULOUS FRIDAY night? Are y'all ready for the upcoming weekend? ANY exceptional plans? Anyone working on WINTERIZING their homes? Robert will be cutting wood tomorrow next door on our landlord's property. We just recently bought a cord and a half of cedar (we LOVE the smell, although it does burn much faster than oak) and our landlord has been kind enough to offer up an oak and a pine tree that have fallen and are ALREADY seasoned!!! Robert will also be draining the swamp cooler and putting a cover on it as well as putting his birdhouses in safe and dry storage before the rains come. This is TRULY our favorite time of the year!!! The air is already CRISP and COOL in the mornings and evenings! Robert came home yesterday from work with FOUR bottles of YUMMY liquid potpourri, most of which were our favorite scent for fall, Pumpkin Spice!!! Robert is such a practical joker and all-around humerous gentlemen and he can pull off a good one without SO much as a smile on his face! NOT ME! I start busting up before I can even get two sentences out of my mouth!!! Anyhoo, I walked out into the living room and asked what that YUMMY smell was? He replied, "what does it smell like?". I wasn't sure but it was a bit on the sweet and delicious side and then I spotted one of our son's cup of tea on the counter and thought it was that. Of course, I was busy in here on the computer and didn't have time to be SO distracted!!! My oldest son walks in from work and asks what it is that smells SO good? ROFL! We were none the wiser as Robert had pulled the wool over our eyes and had us thinking we were simply "smelling" things that were not there! This morning while putting towels away from the dryer, I happened to notice a partially used bottle of something sitting on the table in our spare room. Natuarally, I just had to take a CLOSER look as I'd not seen the bottle there before. And what to my wondering eyes should appear? A label that read POTPOURRI - FOOLED YOU dear!!! Okay, so I added in the last part!!! ROFL! Now all I need to do is clean house this weekend and bring out the FALL decor and my darlin' Robert will be OVERJOYED!!! He has asked me twice now why I have not yet decorated! What a guy! Okay, I'm sure that y'all have finally figured out that I do the majority of my blog postings LATE at night as that is the best time for me to do so without a MILLION distractions from all of the adults in my house!!! LOL! 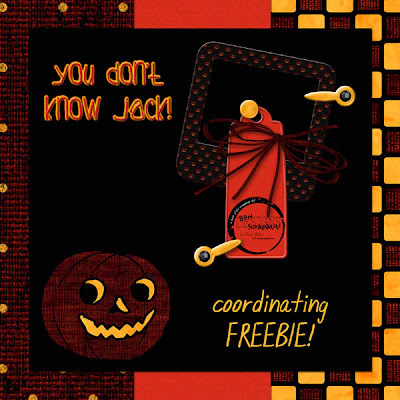 I hope that you ENJOY this Friday's FREEBIE, which coordinates with my "You Dont' Know Jack" scrapkit, which can be found on sale through the month of October for ONLY $4.50 in my 3S STORE! This kit is HUGE and is done in TRADITIONAL Halloween colors of Orange, Yellow. Black and White. There are a TOTAL of 18 background papers and a PLETHORA of elements that will take you WAY beyond Halloween with all of the WONDERFULY patterned papers that will work well for MANY occasions and FESTIVE events. "You Dont' Know Jack" is PERFECT for girl and boy layouts, FALL, black and white themes (you'll LOVE the black and white checkered paper and alpha! ), parties, outdoor fun and SO much more! If you look further down my blog, you will see the TWO previews!!! I will be adding MORE coordinating FREEBIES through this month as I have MANY papers and elements that did not make it into the kit, SO make sure to stop by for each FABULOUS FRIDAY FREEBIE throughout the month of October to collect them all! Have a SPLENDID weekend y'all and BON SCRAPATIT!!! WOO HOOOOOOO!!!! She is LIVE and has an AWESOME freebie to share!!! 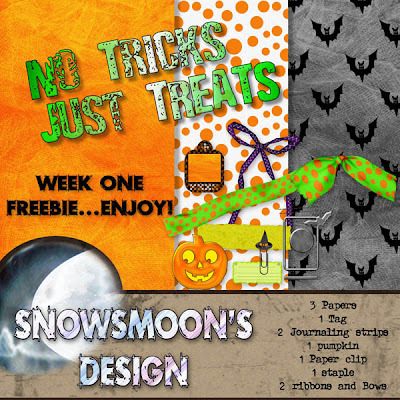 My BEST FRIEND and DIGITAL SCRAPPING colleague of 2-1/2 years, Dawn Mills aka Snowsmoon, has just completed her VERY first scrapkit, "NO TRICKS, JUST TREATS", has started a BLOG and is offering this SWEET kit for FREE throughout the month of October!!! You've GOTTA check it out and add this LOVELY creation to your collection of Halloween/Holiday scrapkits!!! I am SO proud of you girlfriend and wish to thank you again for ALL the help that you have been to me over the years as well as a TRUE and LOYAL friend, ALWAYS there come rain or shine!!! Well my PRETTIES, what are we waiting for, let's GO download this baby!!! And don't FORGET .... tomorrow is FABULOUS FRIDAY FREEBIE and I shall have a little something for you! STAY-TUNED for the FREE 3Scrapateers' October F.U.N. Mega Kit!!! OMGosh y'all, this one is NOT to be missed!!! I submitted my contribution to the UP and COMING 3Scrapateers' October F.U.N. 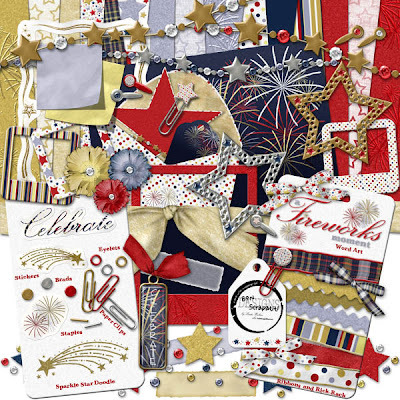 Mega Kit, "Precious Memories", yesterday and this scrapkit is just GORGEOUS!!! There have been a TOTAL of "17" 3Scrapateers' designers that have contributed to this AMAZING heritage scrapkit and it will be yours FREE!!! The previews are being made and the ENTIRE mega kit will be available on the 3S Homepage VERY soon!!! I will notify you here just as soon as it has been released with a link that will take you right to it for downloading! Now, to be able to unzip the GOODIES, you will have to attend one of the TWO crops that are to be held on October 24th. One will be one held in the afternoon and one in the evening. This, of course, is to ensure that EVERYONE around the globe will be able to get the PASSWORD to this MAGNIFICENT collection of scrapping delights!!! I am off to work on my next kit which will be for my VERY first Half-n-Half at 3Scrapateers! I am VERY excited about this too!!! WOW! How much EXCITEMENT can this girl handle in one month??? ROFL!!! LOTS and LOTS ... bring it on! Oh, I almost forgot! I will have a FREEBIE for y'all on Friday. I'm thinking of calling it "FABULOUS FRIDAY FREEBIE". Not very original I know, but appropriate! Whatcha think? Let me know. If one of y'all come up with something I like better, I 'll give you another SPECIAL freebie for introducing it to me!!! Have a BEAUTIFUL day eveyone and Bon Scrapatit!